Prerequisites: This tutorial assumes that you have already learned about Managing Files. - Click the Templates folder in the Files. 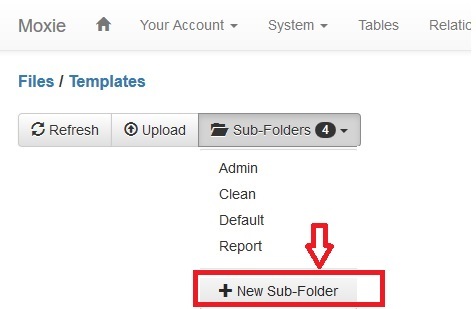 Then Click New Sub-Folder under the Sub-Folders dropdown menu and create the folder. - After you created the template folder, click the folder you created. 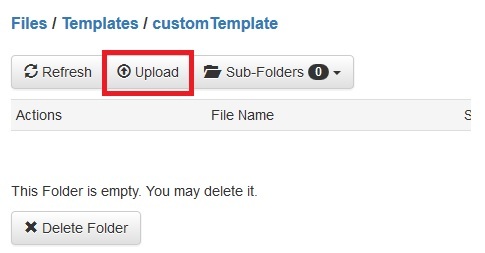 Then Upload the template file using the Upload button. - Tips: If you don't know how to create the custom template files, please copy the default Moxie Template file to the template folder you created. a. Click the = button and create a Procedure. b. Add Moxie command TemplateName with template location (without '/template') in the Source Code field. Then create the procedure for the page. - You can add CSS and JS folders under the custom template folder. Then add the links on the custom template file.